With a length of approximately 16", the Stygian Owl is a moderately large member of the genus Asio, which also includes species such as the Long-eared Owl and Short-eared Owl. Like the Long-eared Owl, it has long "ear" tufts and bright yellow eyes. Stygian Owls are dark brown above and mottled with white and pale brown below. 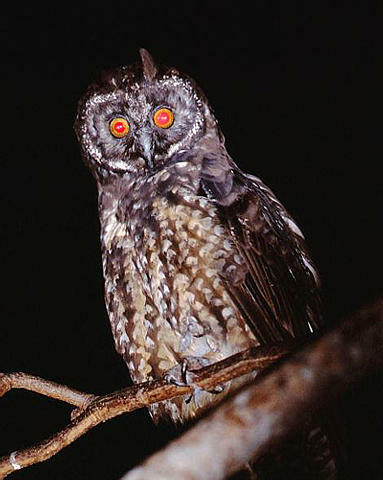 The range of the Stygian Owl extends from Mexico and Central America as far as the southern parts of Brazil. On rare occasions it has been seen as far north as Texas. The race found on Hispaniola is considered a distinct subspecies, Asio stygius noctipeteus. The Stygian Owl prefers forests and semi-open landscapes and tends to be strictly nocturnal, hunting bats and other small mammals, birds, and insects. It usually breeds in the abandoned nests of larger birds, with two eggs being an average clutch. Website describing the conservation efforts aimed at the owls of the Dominican Republic, including the Stygian Owl.